Owner and headmaster of Portland, Oregon’s acclaimed Northwest Woodworking Studio, furniture craftsman and teacher Gary Rogowski offers a personal and meaningful meditation on finding focus, mental clarity and purpose in the modern age of distraction. This is one highly respected woodworker’s observation and journey into a passion and exercise that keeps him whole and gives him perspective as he navigates a world filled with intrusions. 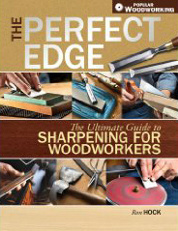 Chronicling why craft matters, this is a book most woodworkers can resonate with.